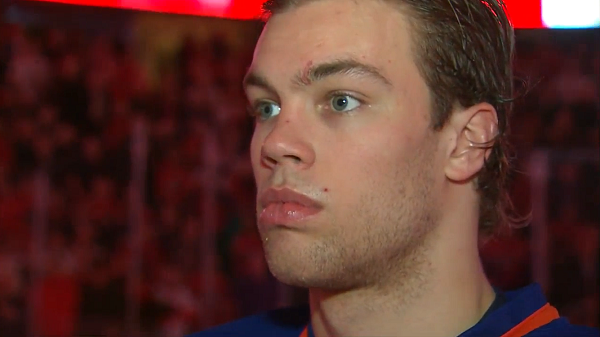 Taylor Hall is Edmonton’s top winger and best player. How does he compare to the best in the West, and how many goals can the Oilers expect from him next season? It’s summer, which is both awful for a writer like me (nothing’s happening) and great because it represents a chance to dig into some things I wouldn’t get a chance to look at in busier times. The idea here is to create the best projection we can for the 2014-15 Oilers, starting with goals for. To do that, I’ve looked in three areas. The first area is “Games and Usage”, where I’ve tried to create a reasonable number for games played based on history and also to project even-strength and special teams usage in the coming season. The second area is “Goal-Scoring Curve.” We know a player’s offence waxes and wanes based on his age, so I’ve used a rough NHL aging curve (it’s based roughly on the work of Gabriel Desjardins and Eric Tulsky, which found that players tend to peak around age 24-25) along with the results of the last four years to project an average shots-for rate at both even-strength and on special teams (via ExtraSkater.com). Shooting percentage also gradually declines, but because it fluctuates dramatically from year-to-year I’ve just used a flat average rate based on the last four seasons. The drop is gentle enough that this shouldn’t be too significant. Finally, in “Comparables” I’ve compared the projected goal-scoring total to the number posted by the equivalent player (i.e., for Taylor Hall the winger who gets the most ice time) on the eight Western Conference playoff teams last year. One further note here: in all cases, we’re ignoring empty-net goals. Hall has missed 46 games to injury over the course of his career, which equates to losing 13 games over an 82 game season. With that said, he’s been healthier of late, missing only seven games last season. I’d split the difference and say 72 games played is a reasonable expectation for 2014-15. Because Hall played for the Oilers last year, it’s pretty reasonable to project last year’s minute-per-game numbers at even-strength (16.45) and on the power play (3.17). He also played 22 seconds per game on the penalty kill, but as he’s averaged between 1-3 seconds per game the last few years in the discipline I’m inclined to ignore that. One interesting note there – Hall’s even-strength shot rates fell off dramatically last season. I’m inclined to think that a) it was a result of a sub-optimal Oilers’ five-on-five strategy, and b) the coaches will figure it out this season, which will get Hall back on track. At even-strength, we’ve projected Hall to play a little over 1,180 minutes next season. Using our estimated shots/hour rate, that works out to 209 shots. As Hall has shot at an 8.9 percent clip at even-strength over his career, that works out to 19 goals at even-strength. On the power play, we’ve projected Hall to play slightly less than 230 minutes next season. Using our estimated shots/hour rate, that works out to 52 shots. Hall has shot at a 20.4 percent clip on 157 power play over his career; given the small size of the sample and the fact that the NHL average last season was 12.2 percent, I’m inclined to split the difference and guess that he’ll fire at a 16.4 percent clip. That equates to 9 goals on the power play. Our eight comparables averaged 30 goals from their most-used wingers (29.5 if we average all eight; 30.3 if we toss the top and bottom results) last season. It’s a pretty formidable list, and Hall’s expected 28 goals puts him right in the middle of it. Hall could become the best LW in the game when we figure stuff out as a team.nuge is bound for a better seasons too.so much potential. Hallsy is going to break some defenceman ankles flying by them and pull some goalies muscles ripping it top shelf, followed by cellying hard pointing at lil Nugey and smiling. Lil Nugey will sleep well that night. My prediction for 38 different nights this year. I would like to change our first line on 5 on 5 . Power play can remain the same with the three of them . Like to see Hopkins and Eberle perhaps play second line 5 on 5 with Pouliot . Hall with Yakimov and /or Draisaitl and RW Yakupov might prove beneficial . Third line Perron , one of Yakimov / Draisaitl / Arco/Lander , with Purcell . I just don’t figure Hall is best suited for playing along two softer skilled forwards in Hoppy and Ebs . About six options for adjusting first line as it is now that I feel might benefit better overall . Hopkins and Eberle have to show more improvement than last season . Even if one keeps the 3 of them together , currently Halls goal production will hinge on the forward progress of Hopkins and Eberle moving forward . In a nutshell , find a way to split up first line for 5 on 5 play . Hall will be used throughout the entire line-up this upcoming season, just like last. And just like last season, every line with Hall on it will produce. Blog says about six options .Your assuming to much on just one option I put forth . Could be Hopkins and Hall , or Eberle and Hall etc.. Mine was just one option of that to show how it could benefit 3 lines of offense by adjusting first line . Help take the burden of Hall having to be the only physical presence on the line as it is now . Maybe that will help to keep him more healthy as well . I think he is close to breaking 40 goals with one or others on his line handling some of the physical load . Hall, Nuge and Eberle were split up for most of last year. Nuge and Eberle started playing better when re-united with Hall late in the season. I would keep them together for most of the time. If your splitting them up I would move nuge down to 2nd line to play with bigger skilled wingers and have hall/Leon/ebs as first line. Hall/nuge/ebs is an elite line and one can expect even more improvement this year so I fully expect them to play some big and heavy minutes together. Based on how the west is built it might be best to insulate nuge with some size and insert the larger skilled centres between hall and ebs. Maybe Leon can ignite yakupov. They offset eachothers size and compliment eachothers skills. Hall is a beast could score 50 if only he had a centre . He does. too bad the nuge had a bum shoulder and didn’t get to train last off season. nuge will find his game and IMO become of of the better passers in the NHL.he made ridiculous passes as a rookie. hat trick his third game and a 5 assist game his 19th game.Hes no “bust” as people have been saying. just 1 injured year and a year where he started the season a few games late because of the surgery. he had a bounce back year too. I wouldn’t rule RNH out yet. He is not even close to his prime. I remember when he came into the league , prior to the injuries, he looked like a genius on skates. Haha this is a sensitive time in human history, so your very direct post got trashed. But I agree on some levels. Drop Taylor Hall next to one of the top 5 centres in the NHL and he probably finishes top three in scoring. This doesn’t mean Nuge isn’t very good and getting better. Taylor Hall is already a top 10 forward in the game finishing 9th and 7th overall in points in the last two years respectably. His development curve is therefor needless to say a lot faster and further ahead than not only Nuge and Ebs, but than almost everyone’s. Right now he is making Nuge and Ebs better every time he plays with them, but as those two solidify their games (especially Nuge,) this will balance out. Nuge will elevate his game and actually start to make Hall better as well and take some of the burden away from Hall. point production last 2 seasons. if eakins leaves hall-nuge-ebs together for the full year, i can see some big numbers for all of them…i think hall and ebs get 30 a piece. Hall will become the league’s best LW this coming season or the season after. Nuge will break 65+points, put your money on that. Hall will make the 35 goal mark. Perron will break 30 goals. I had a dream last night that Malkin demanded a trade to Edmonton. The last time I was so angry at my alarm clock it involved the Swedish women’s volleyball team… Here’s hoping both were premonitions! I can’t bring myself to be positive about the upcomming season. I just can’t see Yak as a complete player and I think Herr Leon won’t be able to keep up with the play. I also struggle mightily with Hall snubbing Team Canada. So when I say that there is no reason Hall can’t hit 100 points next year… it’s not the koolaid talking. 35-65-100, 50 pim and one 3 game suspension for clutterbucking somebody. JW, I know you’re trying to use analytics to come up with your projections, but every season is different. Hall will no doubt hit 30 goals this year. You can probably book Eberle in to 30 goals as well. Perron will be close, but I’m hoping he hits that mark as well. I don’t know about Yakupov. Hopefully he can really bounce back and hit 30. Four potential 30 goal scorers. That would be sick. Hall will be double shifted many nights next season. 1st and 3rd line duties. Slide him in as well with Draisaitl and Yakupov. Been along time since the Oil had a 50+ goal scorer. If things come together for 4-93-14, I think 40g is realistic for Hall. The stars would really have to align for him to reach 50 (as they would for anyone) – not unheard of though. Overall, I think we’re gonna see yet another level from Hall, Nuge and Yak will rebound and Ebs will be Ebs. Yes. Very optimistic. Maybe the Eskimos are doing it to me. God, it feels good to cheer for a winning team for a change. With RNH still going thru maturation and the lack of legit first pairing d men, we are not going to see the best of Hall this year. While a potentially great player, he requires support around him that pushes the play forward with possession. Otherwise he tries to do too much himself and too many pucks end up in the wrong net. Given less than ideal support around him, Hall needs to strive toward being a more complete player. I would love to see an Oiler get 50 goals. I’ve never seen an Oiler get 50, would love to see Hall come in as a straight Rick “Wild Thing” Vaughn Bad @$$ this year and light the league up for 50 with a chip on his shoulder the whole time. If feels so good to drink the Kool-Aid sometimes. If Hall can bust 80 games out, I reckon he can hit 36 goals and 50 assists. If Nuge has a breakout year and can get 65-70 points, then Hall will hit 40 goals and 57 assists. That’s just my gut feeling. You didn’t factor in a healthy RNH vs an unhealthy one. You also didn’t factor in a better defensive core that we may spend more time in the offensive zone than the defensive zone. I believe he will score at least 30 goals this year. Scoring is not what Hall needs to work on. His play is fine in the offensive zone. It’s his two-way game that is unacceptable for a player with his tool-set. Last season, Hall’s corsi for was just 44.4% in spite of being given the fifth cushiest zone starts of any player on the team. He is visibly lethargic on the back-check, prone to cherry picking, and frequently unhelpful to his team when they’re hemmed into their own end (i.e. He skates in lazy circles while the other team scores). He’s got the tools to be a good two-way player but he just doesn’t use them! 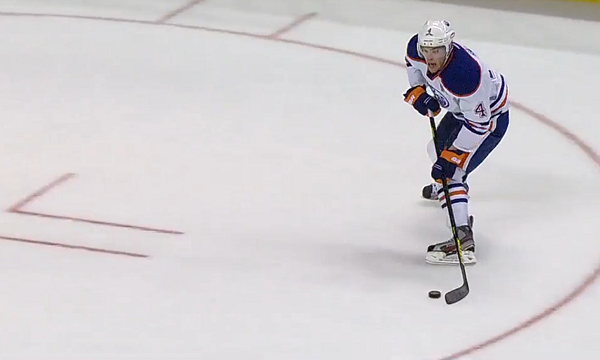 Eakins could do Hall and the team a huge favor if he got Hall to focus on his two-way game. Take away the offensive zone starts. Take away the powerplay time. Make Hall learn how to play in his own end. Keeping the puck out of your own net is as important as putting it into your opponents net.